You are currently browsing the category archive for the ‘Newark’ category. But some wanted to escape black culture and could not afford $20,000 a year. Charter Schools were born to fill that gap. A charter is a school that is not bound by the Federal and State regulatory bodies. They cherry picked their students, and if they do it correctly, they get themselves an all-white school. Newark Charter in its early years had only one minority student. Dave Sokola frequently uses this line. “People need a choice if they are not happy with the quality of their schools”. Many people interpret that as being not happy academically. But that line takes a whole new sinister tone, when you interpret it racially. In searching Newark Charter School’s purchases one sees some interesting things. First, in fairness I should say Newark Charter along with Wilmington Charter have the best rankings in the state. They also have the lowest levels of low incomes, Blacks, Hispanics, Special Ed, Non English Speaking. Something public schools cannot control. There is a reason for their good scores and the Online Checkbook shows it…. Here are a few of their perks…. Ok, there is a lot of good going on here. First: exposure to a lot of things is happening simultaneously. It is no wonder this school scores well. Their students are given the full breadth of opportunity to pursue and grow. Secondly a lot of this money is funneled back into the local economy providing jobs and paying bills in each of our neighborhoods. But like me I am sure the shock will hit most of you rather hard, when you glimpse the scope of how charters spend YOUR money. but this charter according to tests, is getting results for all its money spent; and one can see why that if someone has their child in this school, they will defend charters vociferously……. (And just in case you couldn’t guess so far) this was not written to force any changes to Newark Charter’s liberal use of money…..
What we have here….are two school districts…. that are indeed separate….. but they ARE not equal……………….. This is exactly what Brown vrs Board of Education was set up to avoid. This is exactly what the entire busing arrangement set upon Wilmington and New Castle County, was set up to avoid. The disclosure of this gross inequity, should make every Wilmington Council person livid, breathing fire. It should make every Delawarean recognize the real impetus behind the Charter movement is indeed, racial. And it should make every Delaware legislator realize that any support for Delaware’s Charter Schools as they are, is support for entrenched racism. Let me put it as blunt as I can. We have teachers in Bancroft buying pencils out of pocket so their students have something with which to write …. (the school supplies none; the parents can’t supply any)… while the money that used to come to that school is insteadn now lavishly spent on being “entertained” (by Mr. Joyner @ $7718)….. It is not that what is going on in Newark Charter is so wrong,… no it truly is wonderful (for those students)!… The problem is that all the money for those great things going on there, is being paid for by the likes of Bancroft, Bayard, Brader, Brennan, Brookside, Christiana, Glasgow, Newark High et al. This illustrates precisely the HUGE problem with charters… by design they take from the poor and give to the rich… Now, even if Newark Charter School were all Black, the same problem would still occur, because it’s a charter. The money would still remain concentrated in the Charter and yes, some blacks would get to excel; but it would come as a high cost to all those other ones who could not escape their public schools…. They are doomed to fail through no fault of their own. Charters do not work for society because they take money from the surrounding schools, making all those schools around them poorer, while collecting all the wealthy students into one pocket and giving those a great experience. We are right back in 1950’s again… The two experiences are not equal and that is unconstitutional. And here is the shame of Dave Sokola’s efforts and of his derogatorily remarks towards Wilmington predominantly Afro American schools and their personnel,… He says they are failing and need taken over (by friends of his who will earn excessive salaries), because “those schools” don’t compare anywhere close to the quality of those students at Newark Charter… The achievement gap is wide. Yet if Bayard just had the $142,079 listed above for Newark Charter’s excessive recreation, imagine how broader the environment of all those inner city students would be? One should ask, why don’t they have that money? If Christina School District, just had the $20,000,000 it loses to charters every year, just imagine how that extra $1285 per student, could help? (One class of 20 = $25,700) One should ask, why don’t they have that money? Obviously. Charters need to go. But to kill charters in Delaware, you must first remove Dave Sokola from the 8th Senatorial District and replace him with Meredith Chapman. The DSEA needs to shift some resources behind removing him and the LEA’s should work hard for that same goal…. Charters run themselves exactly like a racist “private” schools, yet do so with the taxpayers’ money. Not fair. If you are Afro American and pay taxes, your own money is supporting the keeping of your race down as long as charter schools remain anywhere near your house. WE NEED TO REMOVE CHARTERS COMPLETELY FROM DELAWARE SOIL.. (or come up with different funding, such as line items for each school in the state budget).. They are separate. They are not equal…. To Privatize or Not To Privatize…. That Is The Question…. Newark City is thinking of privatizing their garbage collection. As a public service, their prime duty is to their customers. Which is you. As a private service, their prime duty is to their investors, not you. As a public service, there is public input allowed on raising the rates. As a private service there is no public overseer of rate rising. As a public service hiring locals, all the money spent on labor, returns to your economy. As a private service the money spent on labor goes to where each employee lives. As a public service if you complain someone follows up. As a private entity, a contract is null and void as soon as the company is acquired by another investor. These are the grand points to ponder… Another is this… can a private service perform the operation as well or cheaper than the city. If savings are sufficient, it may pay to switch…. But this concerns all of you… Please go to the Church of the Nazarene on Paper Mill Road for the discussion and public airing of this proposal… Set this date… Monday, September 21, 2015 … at 6 pm…. Don’t be pushed around… And don’t believe everything you hear about privatization… some of you still remember what happened with Delmarva Power…. Newark had a proposal to get rid of its alderman court. University of Delaware had a proposal to strip $3 million away in funding. But those were threats and never came about…. But, now, we can make room for another project there, one which will do all the same great things, without raising the cancer rates or noise levels among its potential new neighbors…. One: morality won one… Bottom line was that it was totally immoral for the University of Delaware to contribute to the deaths of minors, geezers, and everyone else. Three: Dumb ideas are dumb ideas. Those who said “WTF” at the very first, did the work to pull back the apple skin and discover it was really an onion underneath deserve the credit. As the pro-TDC ad on WDEL fondly puts forth: the truth will explain everything. Five: This was a Wall Street capital venture and nothing else. The people pushing it were used, and we have to be circumspect of everything these same: Markell, the Construction Industry, and Construction unions say now… It is not to the point of pulling support for the prevailing wage yet.. stress yet, but support for doing so has now mushroomed over the past 2 months, because of this… It will take everything they got, to fight it next year… and they may lose. Six: “More Jobs” are not a good enough reason to do destructive things…. We are better than that. Finding the right thing first, then putting people to work, is the better idea. Seven: This administration believes in sneaking things past the public….. The list is long: Privatizing Wilmington’s Port, Charter School Enhancements, Common Core, Smarter Balanced Assessments, rail cars in Delaware, Cash Management Board, Gutting the Coastal Zone Act, support developers over neighboring citizens,… and the TDC. THe first proposal is never what is really going to happen. Eight: Citizens do make a difference… A good nation (state, community, whatever,) is dependent on activism. Nine: We all need to be part of the Star Campus Project going forward…. We need consensus, Not SURPRISE! IT’S DONE! CAN’T DO ANYTHING ABOUT IT NOW!!! It lost the ground it was to be built upon. Completely outside the political spectrum, the University of Delaware decided in its own best interest, that the data center was too much of a problem. The data center can still go forward…. It just now needs another piece of ground…. But for now though, Newark residents will not die an earlier death. That is something worth celebrating…. It is time to look forward into building a fusion reaction research center in that same spot…. courtesy of everyone’s friend, the Federal Government…. Did you know that Bloom Energy was operating beyond the scope of its DNREC permit? It took prying citizens’ eyes to discover this… DNREC says “oops” it didn’t know… I don’t think Bloom Energy has commented yet… But are we to assume that across this entire state, no one knew what the permit levels were, or that this plant was over-exceeding them? The issue lies with their excessive use of natural gas. They are purchasing more than the permit allows… Not a big problem except that of course this extra purchase gets passed on to Delaware’s Delmarva rate payers in the form of extra charges on their monthly bill. But what if the issue instead was pollution? Such as spewing out more radon than allowed. Or more mercury than allowed? Or more cadmium than allowed? Who would know? Someone? Ahhh, but who would say? For example, would you ever trust the entire state’s financial assets to a stock broker who was fined by the SEC for illegal actions? Oh, but wait. Excuse me. In this state we do… Not only do we trust this one person with all of our Treasury, who was fined over $900,000 by the SEC (he sits on the Cash Management Board), but when he whines over the idea of any transparency coming to the Cash Management Board, the governor and his movers in Legislature, remove the Treasurer from being able to watch over this Criminal running his hands through our state’s money? So…. 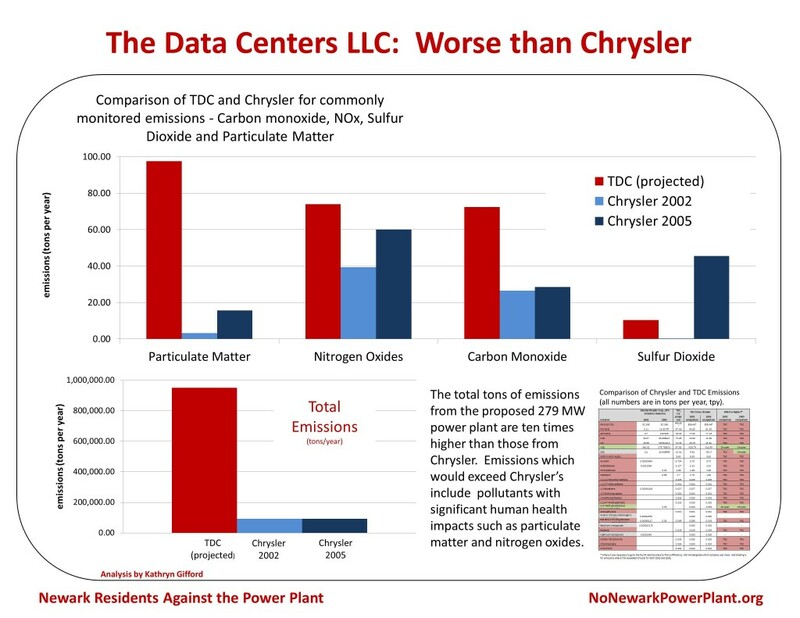 Can we trust this administration’s promises when they say they will keep a tight rein on the Data Center Project’s pollution? What a silly question I just asked… When it comes to this administration, we already have our answer…. Would be for the University of Delaware to use that space to build the premiere forefront of nuclear fusion research…. Not fission, which has radioactive residue, but fusion which turns hydrogen into helium generating heat to rotate massive turbines. Or research into more efficient turbines. All three would be keeping with the promise of the University of Delaware’s green promise, and make it a leading intellectual nucleus for future technology to adhere…. If you have money, you can buy an ad… There is nothing wrong with that. And, you can say whatever you want on any issue ad, even if it is not true…. There may be something morally wrong with that, but it is certainly not illegal… It is protected under free speech…. So if I were to try to get a view across that benefits me, I would buy an ad that lies and says my way is a great way, and possibly demean others who had different views…. A clock starts and game show music begins to play…. Lie one… Power plants can safely be built in residential areas…. They cite Princeton New Jersey as having a power plant within its city…. As you can see, it is a 14.6 MW facility… Delaware will put in a 248 MW facility… What is the difference? I’ll show you. Imagine each X below represents 100 people getting cancer from carcinogens these plants put out through their smokestacks……. Lie two…. This efficient gas driven turbine power plant is safe because compared to coal, it has less pollution…..
What the hell kinda parent are you? We are not talking about putting coal into Newark… We are talking about putting a gigantic gas fired turbine into Newark (see X’s above) … Coal is not even part of the equation… It is a distraction… What is at stake, is this:…. having nothing polluting our air RIGHT NOW…. versus to having a gigantic gas turbine spewing carcinogens 24/7 at full capacity for the next 75 years…. And if you remember…the EPA report showed that more people get cancer from gas turbines than coal fired ones… Really? Yes, really. Simply because gas turbines are located in high density areas, and no one…. lives right next to a coal fired power plant… Just like more trees fall on houses in cities, than they do in the middle of forests…..
No big deal? I would think not. They play two clips…. That is actually true. Listen to those clips and think of that sound continuous 24/7…. while you are sitting in your pool. while you are entertaining guests, while you are catching a few zzzzz’s. or at 3:30 in the am when you can’t sleep…… I mean when chirping birds can wake you out of a deep slumber at 4:30 am, what do you think I-95 running down your street will sound like? I mean, have you ever stood on an overpass across a major highway? You have to shout to be heard…..
And this they say… is not a problem…. That is because they are some ad agency being paid a lot of money to try to influence people and have no incentive to tell the truth. They get paid more if the data center goes in…. and get little or nothing if it does not… They have a vested interest in making you think what they want… Not what is best for you…. The announcer then says time (60 secs.) is up and steers you to their website so they can track you and continue to send you more misinformation….. As with all ads, it is not what they say that is most of the problem… it is what they don’t say…. 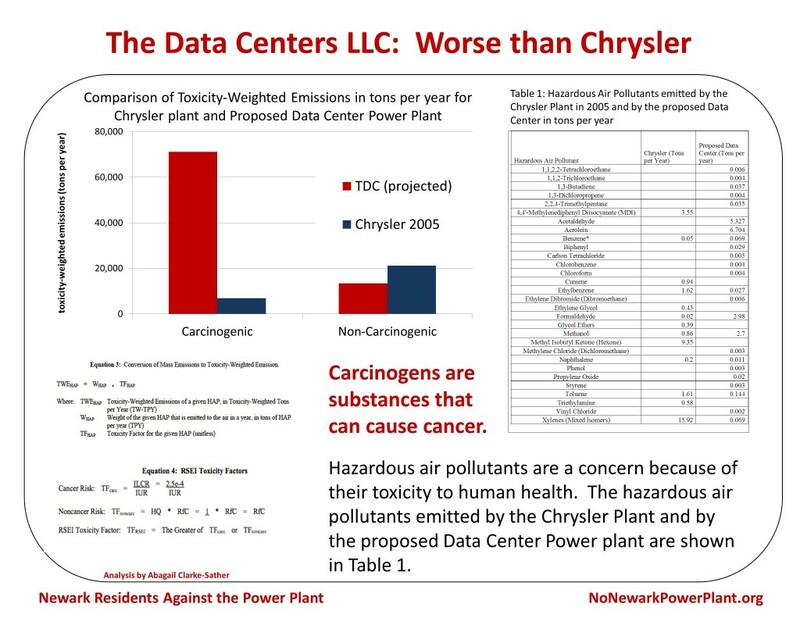 Their report on the level of carcinogens which they are required by law to do… shows that many carcinogens will rain down on Newark… if this plant goes through… Far, far, far more than are falling on Newark now….. In Washington State, there is a chart showing cancer frequency rates among its towns… One town is off the charts… It has a similar sized gas turbine near its residential area…. 75 years is an awfully long time…… Any other business other than a power plant, would give all the benefits… with none of the problems…. And the power plant could then be built in some rural area, with none of the problems this one will give here. It is all about precision. When they say this power plant is good, they don’t say this power plant is good here… When other say this power plant is bad, they aren’t saying all power plants like this are bad…. It is just that campus of the University of Delaware, 200 yds from families’ houses in the town of Newark, is not the best place in the world to build a 248 MW gas fired CHP power plant…. That will never change, no matter how many ads get run on WDEL……. Steve Newton, one of Delaware’s ablest analysts, issued the warning early in the year… I have since been on the lookout for what he called…. I believe…. The Great Distractor”…. Even bloggers take up the outrage, so inflamed are they and smelling blood, all want some credit for a kill…. Meanwhile, real bills that transfer the building blocks put in place over centuries of public schooling , get pulled and shuffled over to private enterprise…. Bluntly put, the rich get richer by picking all our pockets while we focus on the bar fight taking place on the floor directly in front of us, little realizing the entertainment is completely staged for our own fleecing….. Yesterday the same topic dominated both the morning show, and afternoon show on WDEL…. Jonathan Starkey’s piece in the News Journal had done its part….. There was considerable buzz; legislators were being called up on air, and duly pitching their outrage to get their name out in front of the voters…. The controversy is over the unclaimed property issue… Basically everyone is upset over how the government can claim unused gift cards… Yes, if you listened… that is what the entire controversy boiled down to. , The Republicans think they have an issue. The Government is taking private property because…. they can…. So let us pop this “distractor” and get back to reality… All this controversy is about who should own unclaimed property… Two people see a dollar bill in the road… Who should get it? Why does one have more right over it than the other? Should corporations be allowed to keep money that is not theirs? If I find a wallet with $500, should I keep it and spend it on me? Or should I turn it in to the police, and if no one comes and claims it, they then get to use the proceeds in their service to all…. Obviously, the latter is the more fair. I certainly have no right to that wallet, except by some made-up rule …. finders-keepers. Who does that money belong to? It belonged to someone, one of those who are protected by the police, and who are an individual just like me… Who is more likely to get an inquiry requesting whether anyone turned in a wallet with $500? A random stranger (me)? Or the police?…. Again, it is obvious to which one society would benefit having ownership of that dollar found in the street….. And the amounts of money are paltry… dollar bills for the most part…. Oh, but the outrage!! The Outrage! The outrage….. They almost need this distraction… In a very bad way…. Meanwhile they they insist on pushing forward the TDC, to the detriment of all those 30,000 Newarkians who will soon be breathing cancerous particles 24/7…. Meanwhile they insist on pushing a Charter School agenda forward when next year’s charter schools can only muster 40% capacity. Meanwhile they insist on pushing Common Core, by now a completely debunked curriculum, that was so obviously created to summarily give one educational-material corporation an advantage over all others…. Meanwhile, Delaware’s budget shortfall grows as the economy suffers under too low taxes and way too few government jobs. Meanwhile, Delaware is giving far to much of our precious few resources to corporations who repeatedly, had always failed to deliver any return for our investment…. Meanwhile, Delaware is destroying the 39th best teaching school in America, the educational department of the University of Delaware, to water it down to the abysmal Common Core standards…..
What this administrations sorely needs…. Instead we should be watching out for…….. Looking forward to the necessary modifications to SB 51 and HB 165. And the fact that during these 8 years… Delaware’s children in poverty…. DOUBLED! On Rick Jensen today this occurred. Ask him for the podcast… More later….